A growing number of traditional American retailers are in intensive care -- and Amazon put many of them there. The number of distressed U.S. retailers has tripled since the Great Recession and now stands at the highest level since the end of the downturn, according to a recent Moody's Investors Service report. These companies are grappling with intense competition, "erratic management" and limited financial flexibility, Moody's said. The 19 retail and clothing companies on the distressed list include Sears and Kmart owner Sears Holdings (SHLD), J. Crew, Payless, Claire's, Rue21 and True Religion. The report is a sobering reminder of the consequences of the rise of e-commerce, especially Amazon (AMZN). "It's been a downward spiral for traditional retailers," said Christian Magoon, CEO of Amplify ETFs, which last year launched a fund that tracks online-focused retailers. "The model of online retailers is winning out. They are more competitive on pricing, they have better selection, and their convenience level is quite high," Magoon said. Online retailers are also free of the substantial real-estate and labor costs that weigh down brick-and-mortar stores. Recent weeks have provided new evidence of the struggles of traditional retail. Sears stock recently plunged to an all-time low, JCPenney (JCP) announced plans to shutter up to 140 stores, and Target (TGT) shocked Wall Street with terrible holiday sales. All that comes on the heels of tens of thousands of retail layoffs and the bankruptcies of RadioShack and Sports Authority over the past two years. It's no wonder the Amplify Online Retail ETF (IBUY) has vastly outperformed its physical peers. The online ETF is up 18% since its debut last April, compared with a 4% decline for the broader SPDR S&P Retail ETF (XRT), which tracks mostly traditional retailers. So will more retailers go the way of RadioShack? Moody's said the key is that the 19 distressed retailers have "stressed liquidity," meaning they may have trouble quickly accessing cash should they need it. That's a big deal because these struggling retailers owe a combined $3.7 billion in debt over the next five years. Nearly a third of it is due by the end of next year. Moody's warned that a poorly timed debt maturity could "quickly trigger default" for a company that has limited financial flexibility. For now, even struggling retailers can turn to the bond market to borrow money and roll over their debt. But Moody's said that "could change abruptly" if U.S. interest rates rise rapidly or sentiment shifts. The other clothing companies on the distressed list are Gymboree, Nine West, NYDJ Apparel, Toms Shoes, David's Bridal and Totes. The other retailers are Fairway Market, Tops, Bon-Ton Stores, 99 Cents Only Stores, Savers thrift stores, Tucker Rocky and Charming Charlie. The financial trouble threatens to infect even healthier retailers. That's because struggling retailers are forced to offer big sales to lure in shoppers. Sometimes these companies offer "irrational" discounts that drag stronger rivals "into a race to the bottom," Moody's wrote. Traditional stores can be threatened even more if financial stress causes some retailers to liquidate their inventory or even resort to going-out-of-business sales. 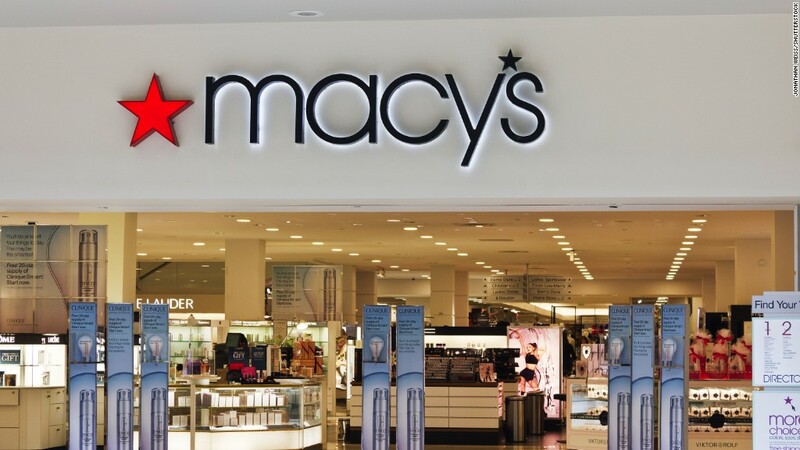 Brick-and-mortar stores like Macy's (M) and Best Buy (BBY)have been forced to adapt by spending heavily on upgrading their online platforms that now make up much of their growth. Even retail king Walmart has shelled out billions to acquire e-commerce players like Jet.com. Even though analysts don't doubt the transformative impact of e-commerce, it actually only accounted for 8.1% of total retail sales in 2016, according to the U.S. Census Bureau. However, e-commerce sales are growing rapidly and its market share has doubled since 2009. There are other drivers of the financial stress for traditional retailers as well. Moody's also pointed the finger at the private-equity practice known as leveraged buyouts. This practice saddles companies with heavy amounts of debt to pay for their own takeover. For instance, Moody's noted that retailers like Claire's and J. Crew are dealing with "weak" balance sheets after takeovers that required them to take on lots of debt.